Kelly Dawson Author: Snow! In APRIL!!! It's April. Here in New Zealand, that means it's Autumn. Summer is over, Winter is coming. But it's not here yet - at least, it's not meant to be here yet. But, apparently, it is. Out-of-season snowfalls are quite common in this, the southernmost part of New Zealand, but even after 7 years down here, I'm still not used to it. I'm from the North Island - where my first book, Bracken Ridge, is set. 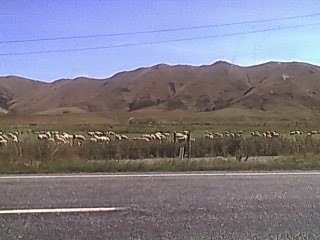 But my soon-to-be-released book Rachel's Journey is set down here in Southland. And there's plenty of snow in it too. The snippet I'm sharing with you here is snow at the other end of the season - the end of winter/beginning of Spring - right in the middle of lambing. Rachel was so cold she couldn’t feel her limbs. She tried to move her fingers, but she wasn’t sure if they worked or not – she couldn’t feel anything. She was drenched from being out all day in the elements, and the wind had chilled her to the bone. Her oilskin over the top of 3 layers of fleece outdoor gear had kept her warm initially, but once it got saturated the wind got in, and she’d started to get really cold. But she’d kept going – she had to save the lambs. She had no idea where James had gone, hopefully he was saving lambs too – and she hoped he was saving more than what she was. She’d managed to put wool covers on most of the vulnerable newborn ones, and mothered-up a few abandoned ones and several triplets. But there were so many she couldn’t save. She’d just come across another dead one. At first she’d thought it was just weak and cold, but after rubbing it all over, she knew there was no hope for it. So cold, and feeling so helpless, all she could do was cry. And that was where James found her, half an hour later, sitting down on a patch of wet grass, surrounded by snow, cradling a dead lamb in her lap, tears frozen to her face. “Come on mate, let’s get you home,” he told her tenderly, as he disengaged her fingers from the lamb and helped her to her feet. She couldn’t stand, her legs were too cold to work, and she clung to James helplessly. He was wet and cold too – his hair was plastered to his face and water was dripping off his chin and the end of his nose. “I… I … c…c… can’t … st… st… stand,” she stammered through chattering teeth, her whole body shivering violently. “Mmmfff,” Rachel groaned, as James threw her over his shoulder none too delicately. Can’t you carry me in a nicer manner? She complained in her head, but her tongue was too cold for her to get the words out so she couldn’t voice her discontent to James. Not that she had long to mull over her most unladylike position – the bike was only a few metres away and it only took a few seconds before James slid her down onto the bike before climbing on as well to drive them home. Down here, unfortunately, lambs die when we have a big snowstorm right on lambing time. It's heartbreaking for the farmers, who work tirelessly to save as many as they can. I hope you enjoyed my portrayal of farming life in NZ with this snippet of Rachel's Journey. Keep an eye on my blog for more snippets coming soon!